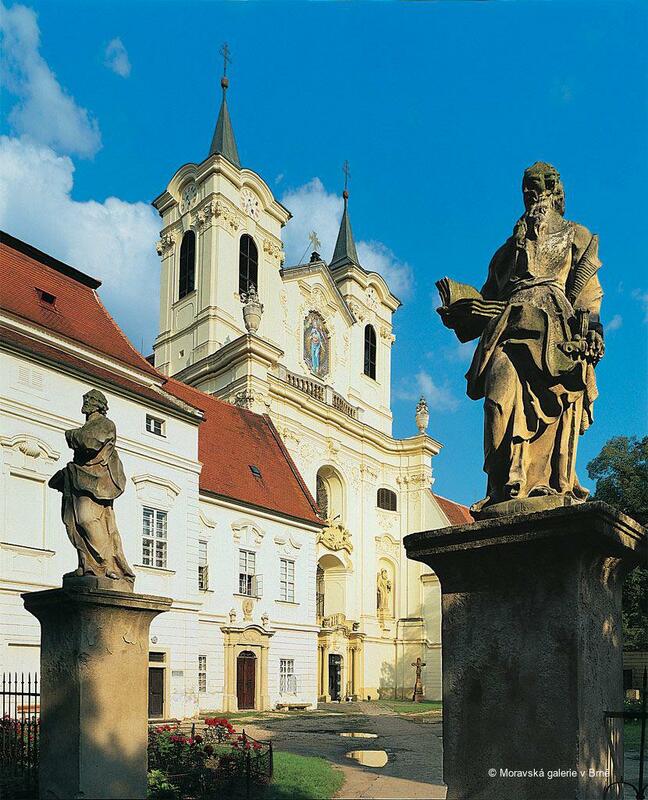 The monastery is one of the largest in South Moravia and the only one owned by the Benedictine order. 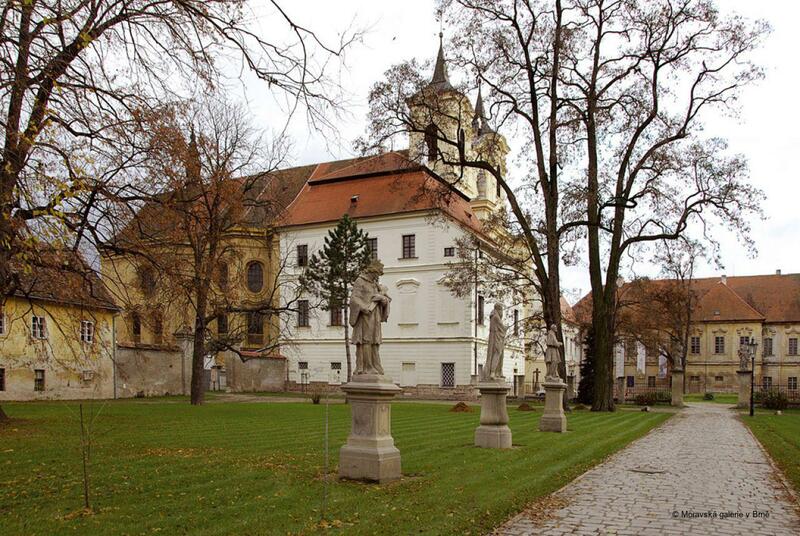 It was established in around 1025 as a branch of a monastery in Prague-Břevnov, on a site of an old settlement. 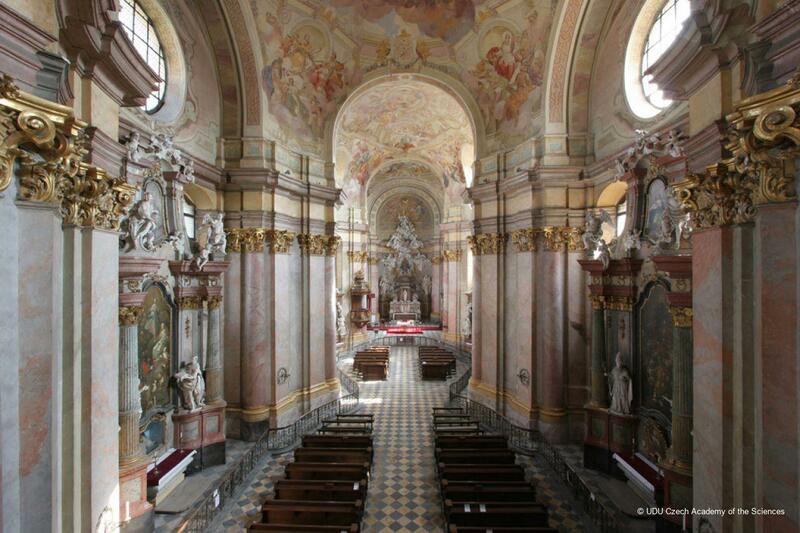 Until the 17th century it maintained a largely Romanesque appearance (reconstructed to a design by A. Erna in 1670). 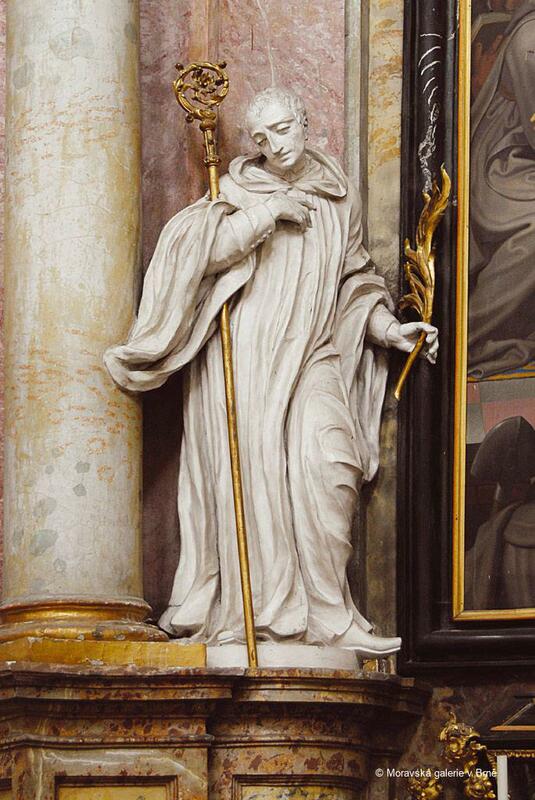 The reconstruction, triggered by efforts to promote the monastery to an abbey, started in 1721. The majority of the original buildings were demolished and the restoration was only completed in 1840. From 1540 onwards Rajhrad provosts held seats in the Provincial Assembly. The monastery played a key role in local education and in the development of the economy establishing the tradition of winemaking and beer brewing, and facilitating the construction of hospitals, workhouses and orphanages. After 1623 the monastery housed a prestigious school. 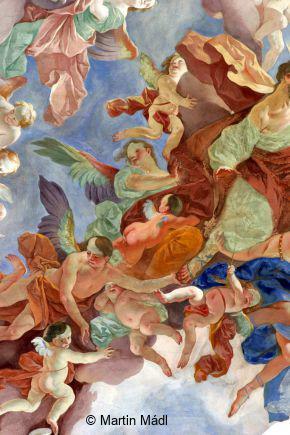 It is famous for its large picture gallery which acquired art works from dissolved monasteries and chateau collections. Among the monastery’s valuable collection is the Rajhrad Altar (c. 1420). The monastery church was surrounded by four courtyards. In front of the west front is the prelature, in the south section the monastery, and opposite are two farmsteads. Unfinished west spires from the late 17th century were later incorporated into the church building. Structural engineers faced problems with the swampy terrain. 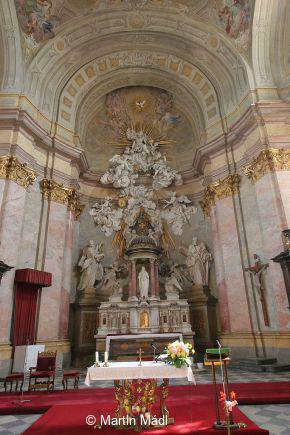 Santini’s design was executed by the Brno builder F. B. Klíčník who reduced the number of neo-Gothic motifs, especially at the front. 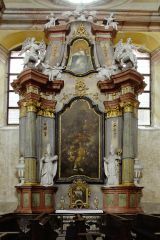 The niches contain statues of St. Vojtěch and the hermit, St. Vintíř. 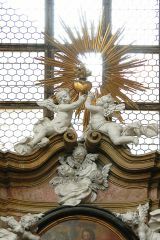 The gable between the spires features a mosaic of the Immaculate Conception (1895). 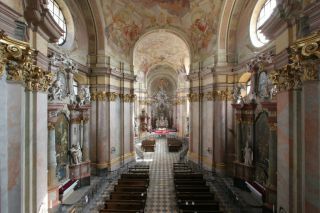 The church, of a triplicate ground plan with a central octagon, is 79.5 m long. Triumphal arches accentuate the depth of the longitudinal space, endowing it with rhythm and monumentality. 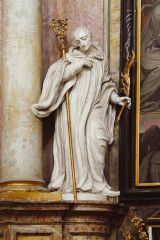 Santini’s design emphasised the optical effects relying largely on subsequent painting components. 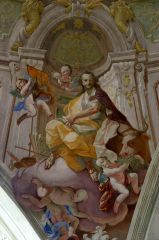 J. J. Etgens’s (1726–1729) frescos celebrate the Benedictine order and its spread throughout Europe, Asia and Africa in the first three centuries of its existence. 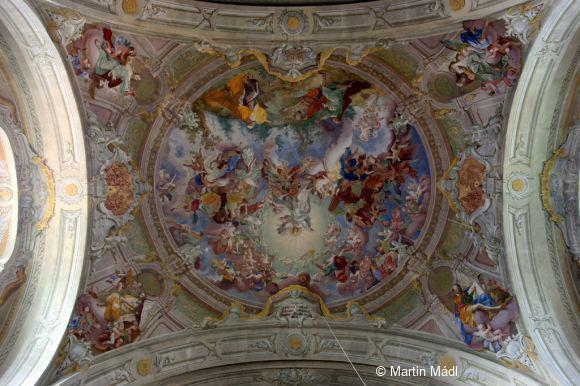 Frescoes above the gallery represent the glorification of the Lord through singing and music. 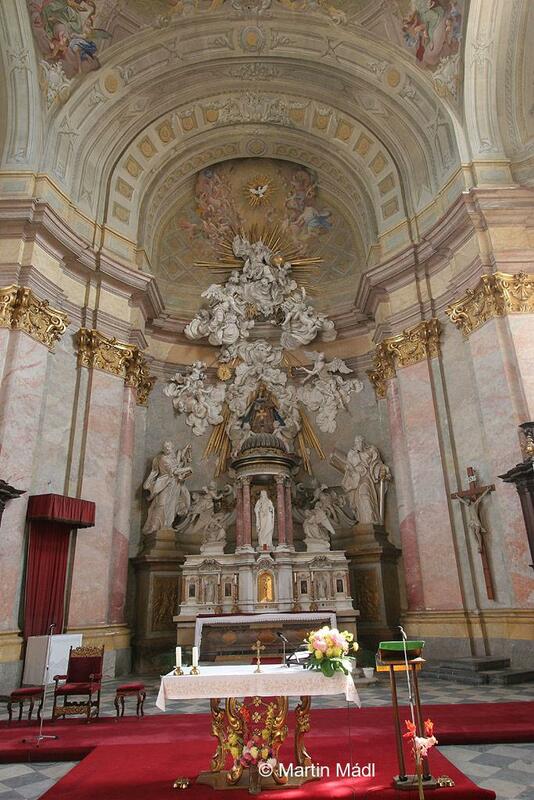 Above the sacristy, the church presbytery is adjoined by an oratory with an altar to St. Benedict. 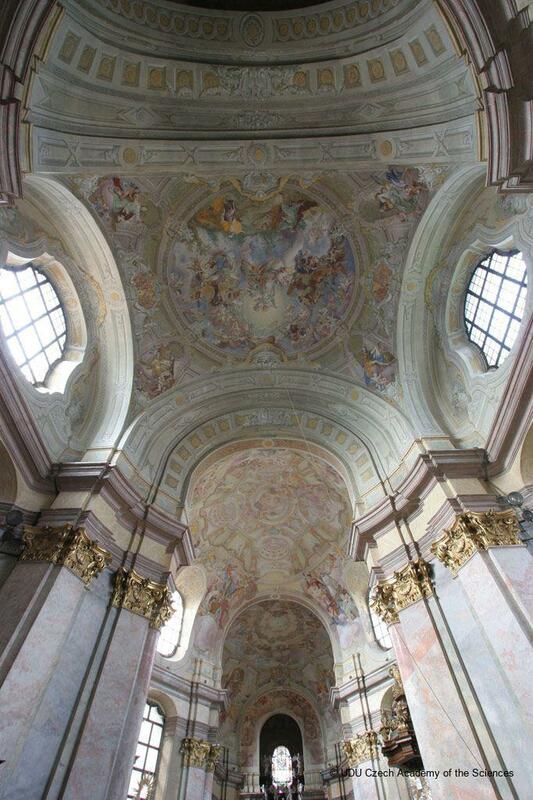 It was decorated with pictures by J. Zelený, a native of Rajhrad and the first teacher of the artist Alfons Mucha. 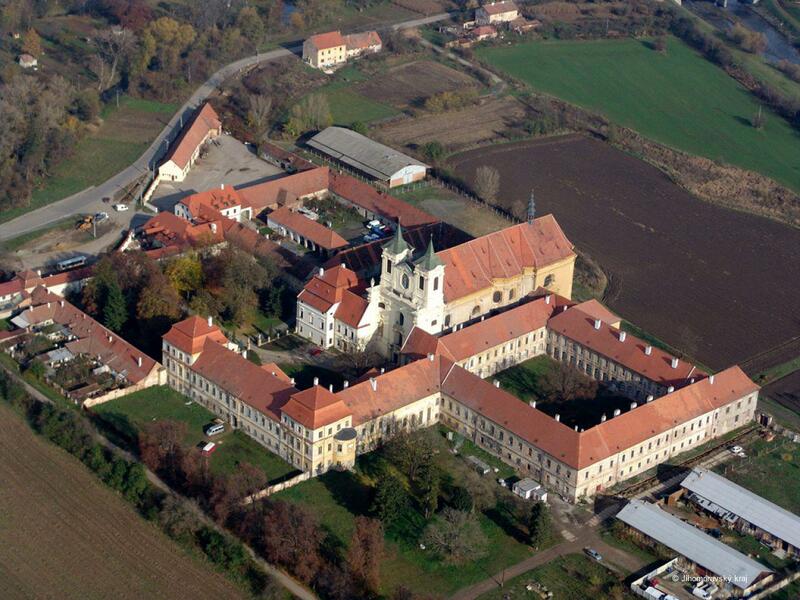 The monastery is one of the largest in South Moravia and the only one owned by the Benedictine order. It played a key role in local education and in the development of the economy. 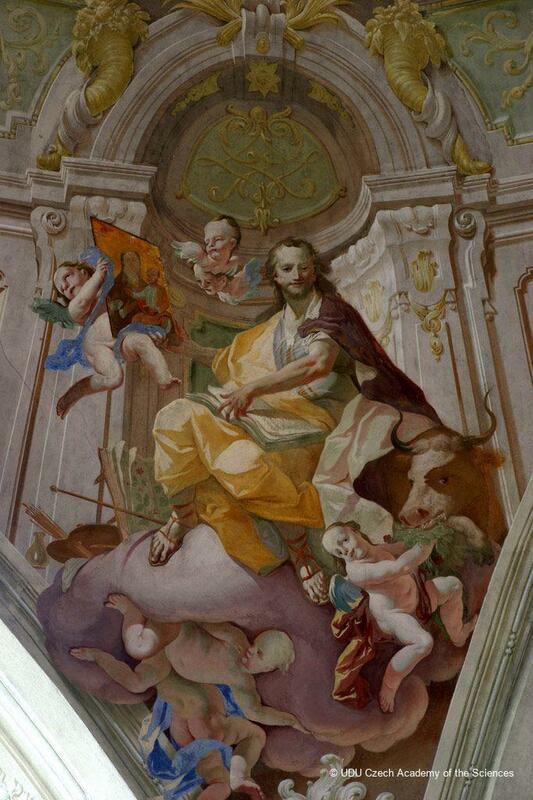 The frescos in the church, by the architect Santini, celebrate the Benedictine order and its spread throughout Europe, Asia and Africa in the first three centuries of its existence. 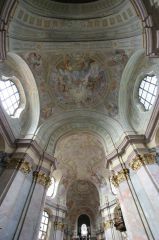 The monastery is famous for its picture gallery. 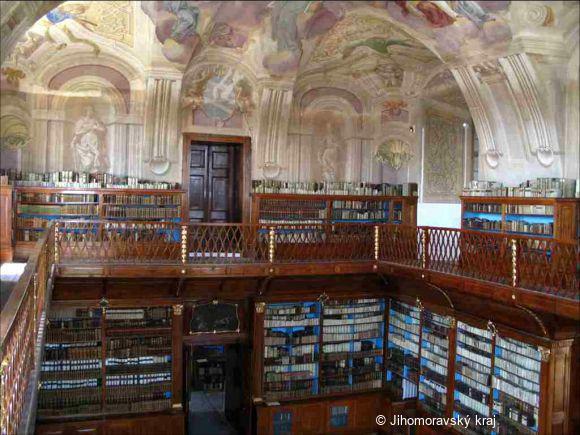 It also houses the Museum of Literature in Moravia. 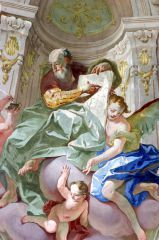 The construction of the monastery is documented by ample sources (correspondence and designs), as well as by records in the monastery chronicle. The original state of the complex is also captured in several engravings. 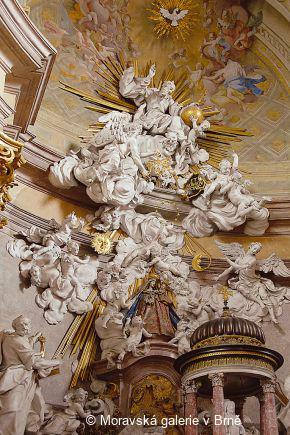 Relief decorations are symbolically connected with the paintings and the light: a choir of angels in heaven, with God the Father on the wall behind the main altar, and a statue of the Virgin Mary of Rajhrad; statues of St. Peter and St. Paul; bas-reliefs representing the Annunciation, the Crucifixion of St. Peter and the Decapitation of St. Paul; a pulpit with a pelican symbol, symbols of the Evangelists and four Church Fathers; a wood carving in the gallery and stone vases on supporting pillars outside the church, which were executed in the workshop of I. Lengelacher, the court sculptor of the Dietrichsteins. 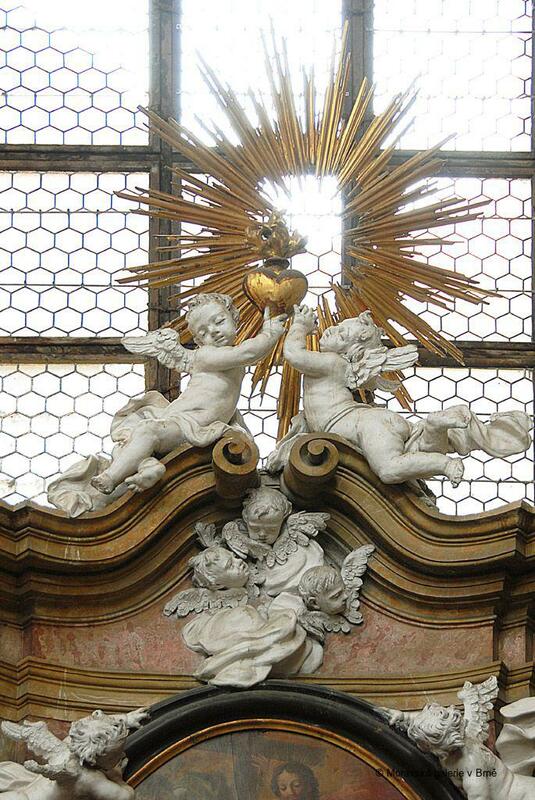 The side-altar statues come from the famous Brno workshop of O Schweigl and Benedikt Edel. The modello for this side-altar painting is preserved in the collections of the Moravian Gallery in Brno, while a preparatory sketch is in the collection of the Ukrainian Academy of Science, Lviv. The central figure is St. Anne, accompanied by her three daughters with husbands and children including John the Baptist, Thaddeus Jude, Apostle James, and the Virgin Mary, mother of Jesus. The church presbytery was rebuilt after an earthquake in 1763 and provided with a new fresco. 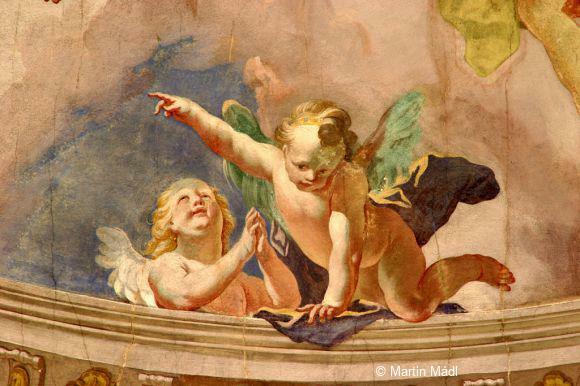 Although the artist took over the position of J. J. Etgens in Moravia in the second half of the 18th century, he went on to execute commissions mainly of a decorative nature. The library was established shortly after the foundation of the monastery and some of the manuscripts were produced here. 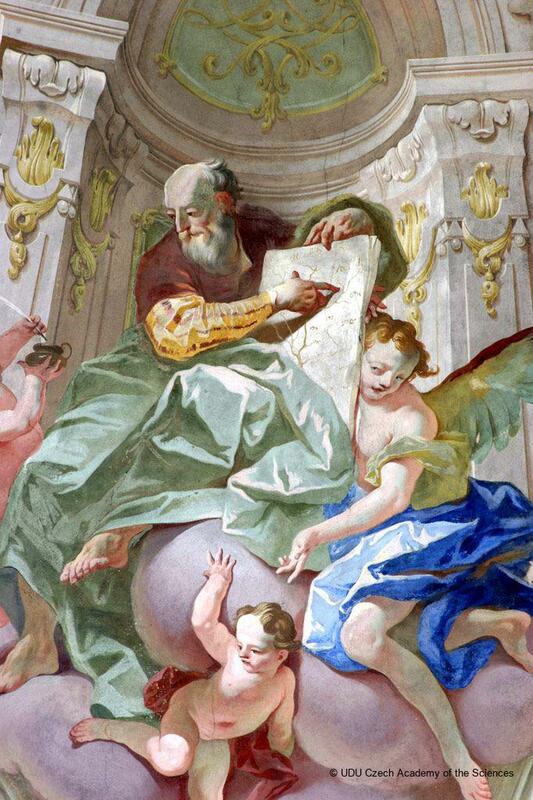 A number of important figures, mainly historians, are associated with the library. 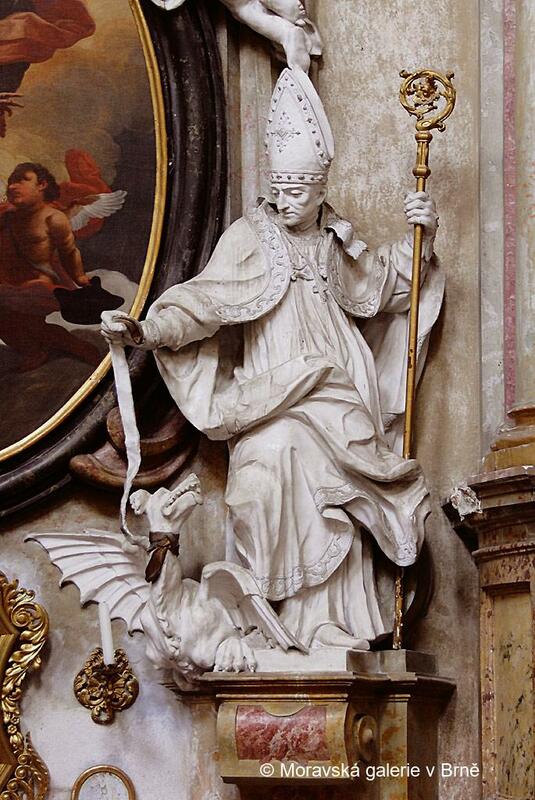 In the mid-18th century the idea of publishing Czech chronicles found roots here (B. Piter). 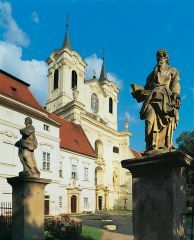 G. Wolný subsequently wrote 15 volumes of Moravian topography and his work became a cornerstone for the history of Moravia. 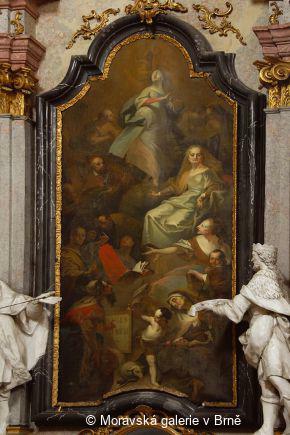 Dr. B. Dudík, a prominent Moravian historiographer, published over 70 scholarly works and must be given credit for the return of large quantities of ancient manuscripts carried off to Sweden during the Thirty Years’ War. 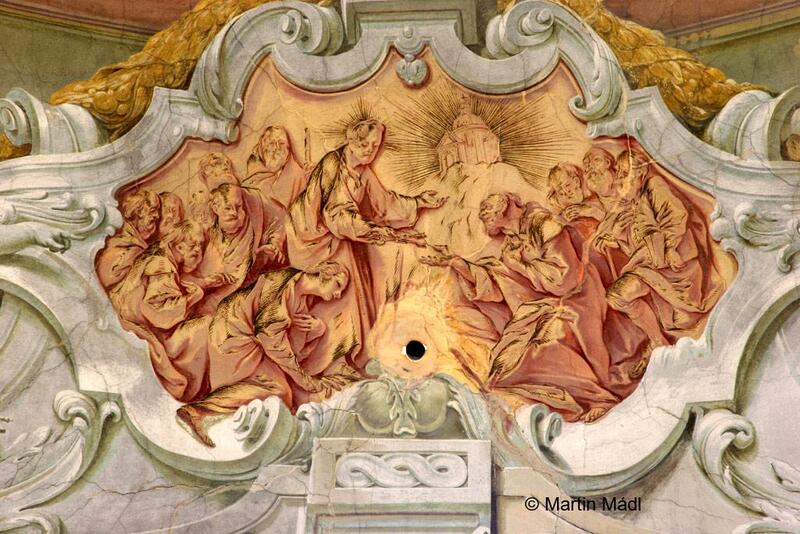 The fresco represents the merits of the Benedictines in the development of the sciences. The library now houses the National Literature Archive. Ivo Krsek –­­ Zdeněk Kudělka (ed), –­­ Miloš Stehlík –­­ Josef Válka, Umění baroka na Moravě a ve Slezsku, Prague, 1996, pp. 65, 281–282, 286, 477. 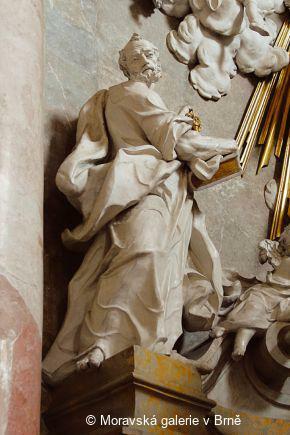 Mojmír Horyna, Raigern (Rajhrad) – Propstei mit der Kirche St. Peter und Paul, Kat.-Nr. 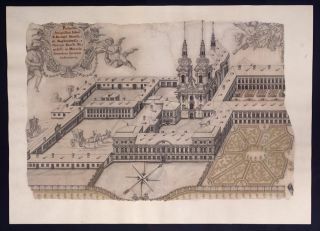 VI/19, S. 125–128 (VI/3), S. 130–134, in Tausend Jahre Benediktiner Kloster in Břevnov (Ausstellungskatalog), Prague, 1993. Jiří Kratochvil – Hana Sedalová (ed), Rajhrad. 950 let od příchodu benediktinů na Moravu. 50 let od nástupu ničivého komunismu, Brno, 1998. Jiří Kroupa, Rajhradský chrám v proboštské korespondenci 18. století, Sborník prací filozofické fakulty Masarykovy Univerzity F 50, 2006, pp. 43–80. 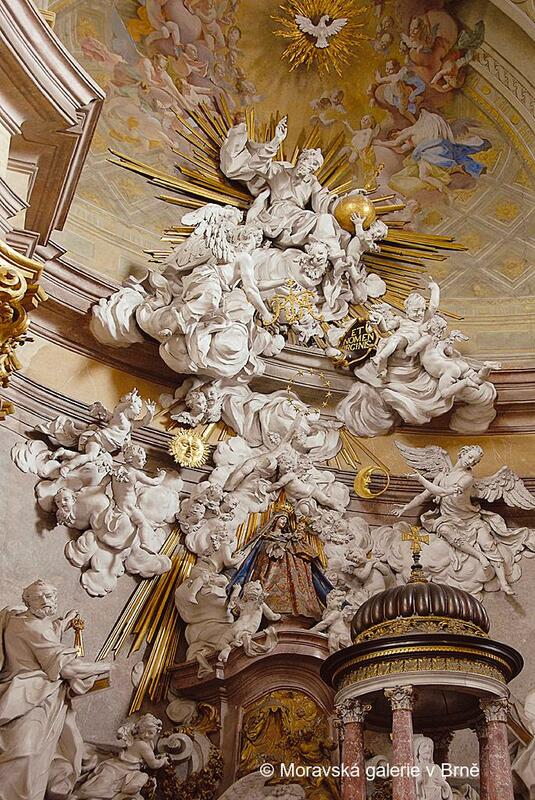 Herbert Karner, „Faciamus hic tria tabernacula“ – Architektur und Deckenmalerei in der Klosterkirche in Rajhrad / Raigern, in Martin Mádl – Michaela Šeferisová Loudová – Zora Wörgötter (eds. ), Baroque ceiling painting in Central Europe/Barocke Deckenmalaerei in Mitteleuropa, Prague, 2007, pp. 163–181. 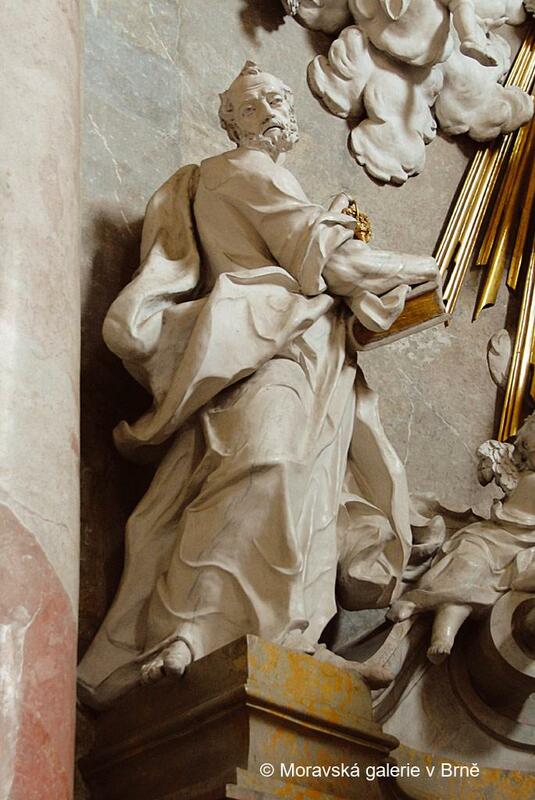 Tomáš Valeš, in: Lubomír Slavíček (ed), Josef Winterhalder d. J. 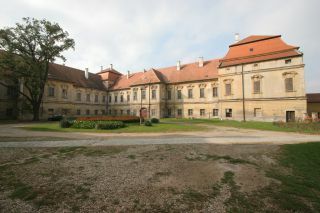 (1743 Vöhrenbach – 1807 Znojmo), Maulbertschs bester Schüler, Langenargen–Brno, 2009. 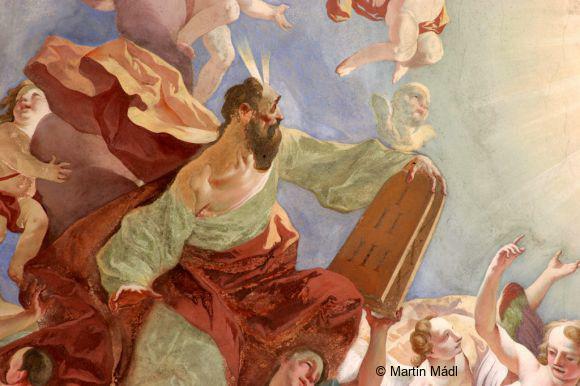 Copyright images "UDU Czech Academy of the Sciences": Institute of History of Arts of the Czech Academy of the Sciences.